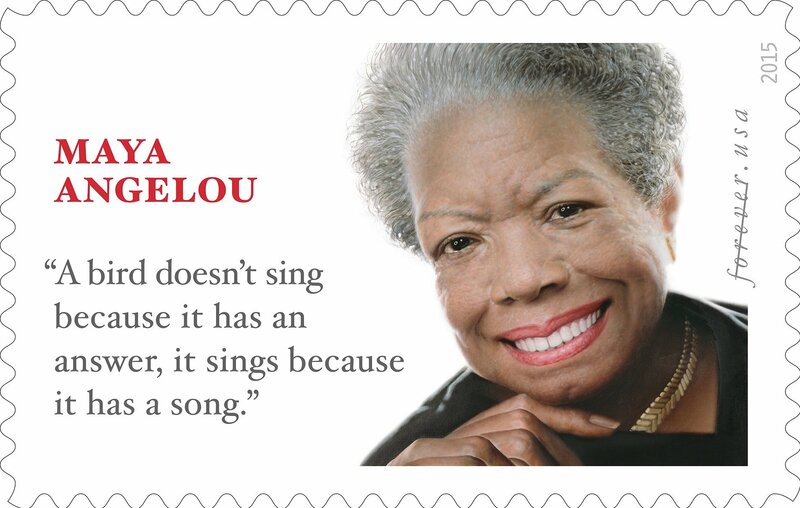 Self-described “nerdy lexicographer” Erin McKean (for whom I have an intellectual crush) discusses today in the New York Times how the US Postal Service has included a misattributed quote on a stamp commemorating the poet and author Maya Angelou. The quote, “A bird doesn’t sing because he has an answer, it sings because he has a song,” has obvious resonances with the title of Angelou’s “I Know Why The Caged Bird Sings,” and it’s a line she herself quoted, but the actual author is the children’s book author Joan Walsh Anglund. McKean discusses “Churchillian Drift,” which is the phenomenon by which a quotation becomes misattributed from a less to a more well-known source. That perfectly describes the process of formation of many of the Fake Buddha Quotes on this site. The term comes from the tendency to ascribe witty political sayings to Winston Churchill. She describes how one of her own coinages (which I have to say I don’t find particularly memorable) became associated with a fashion editor by the name of Diana Vreeland—apparently she’s famous—to the point where McKean has even been accused of plagiarizing “Vreeland’s” words. The column’s well worth reading.